When I open up a program like Windows Media Player, I don't see a close button. Some apps on the PDA have it, some apps don't. Let's take WMP as an example. As I said, I don't see a close button, and I need to force it to close by go to the memory options, and manually remove it from there. I don't think that's the way Microsoft has intended it, so did I miss an option? Another query: In 'normal' Windows (for desktops) you can use Alt+Tab to switch between running programs, is there any shortcut/key for PPC2000 that can do just that? Should just be in the top right. Can I just download it or do I have to use *cough* unofficial *cough* channels for that? Oh and would my 206 Mhz Strongarm, 32MB PDA handle PPC2002? It looks like the 2002 version of PPC. 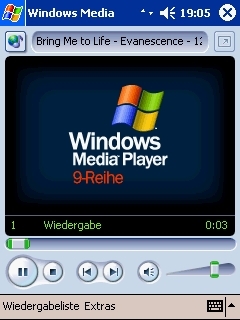 The theme looks different, as does Windows Media Player. ahem...different channels would probably help, but i dont encourage that! Hmm, thanks. BTW, here's a screenie (made with my webcam ) of WMP in action.